Hello, ladies and gentlemen, my name is Chris Leyland and I am the Investment Director who heads up the True Potential Portfolio proposition and I am here today to review 2018 and look out towards 2019 for both the Portfolios and Markets. 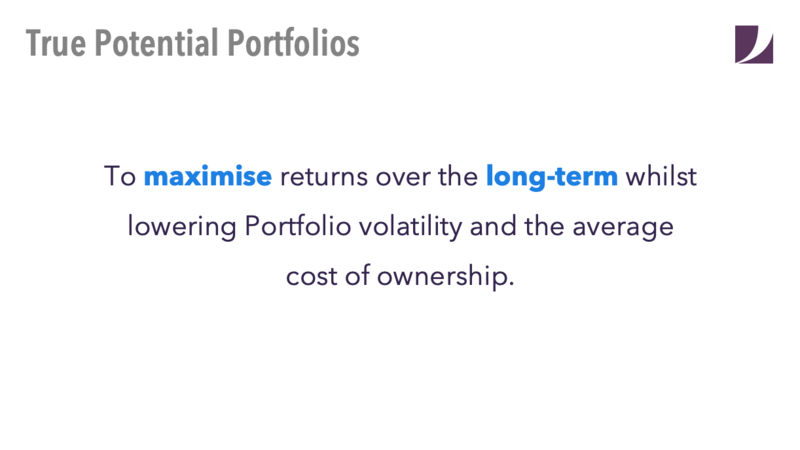 Before we start let’s restate what our long term objective if for the True Potential Portfolio proposition. 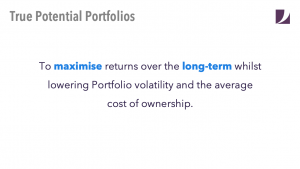 Overall, the goal of the True Potential Portfolios is to maximise return for a level of risk in a lower cost highly diversified investment product. Let’s start by talking through what has happened recently? Overall 2018 was a very challenging year with the figures on the screen illustrating how it compares with previous years. Looking at 2018 on its own, the slide on screen illustrates the performance of each asset class. Up until October, the US equity market had clocked up a new record; the longest lived “bull market”, where share prices are rising, in history. As we moved forward, despite delivering three outstanding quarters of corporate earnings growth, the US market began to falter with more aggressive rhetoric coming from the Federal Reserve and nervousness from the continuing US/Sino trade war triggering a global equity market sell off. Starting with the Federal Reserve, it may seem odd that a group of some of the most respected central bankers discussing how well the US economy is doing and why interest rates need to keep rising steadily would not support equity markets. With the “discount rate”, i.e. the risk-free rate of return, rising, it meant that companies with high price to earnings ratios struggle to maintain their valuations and therefore these were the stocks that first sold off. With trade tensions and the ever growing doubt that US tech giants such as Apple and Amazon could struggle to live up to their newly-acquired $1trn valuations, the news brought major indices in the US down with a bump, with US equities one of the worst performers during the last three months of 2018, although this is on the back on stellar returns in 2017 and early 2018. The UK did not fare very well with political risk continuing to dominate the UK investment horizon all year. “Deal or no deal” varied on an almost daily basis, but very much specific to the UK markets, not really moving markets globally. Within bond markets, you are seeing a dichotomy of returns. Higher quality government paper such as UK gilts have performed well as investors look to more perceived “safe” areas to invest. On the flipside to this, high yield bonds struggled as investors rotated into lower risk paper and a number of high profile corporate mishaps made market participants nervous. Alternative assets came to the fore with investors looking outside the traditional areas of equities and bonds to try and find returns that were uncorrelated to stock market returns. Gold fared particularly well as investors looked to derisk their positions. 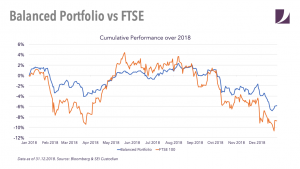 It is never comfortable to say one has performed well when client values have been pared back, but the if we compare the annual performance to a reference point, say the FTSE 100, this is down nearly 8%. 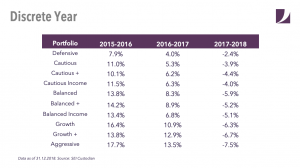 Diversification within the True Potential Portfolio has helped clients not experience such a large fall. 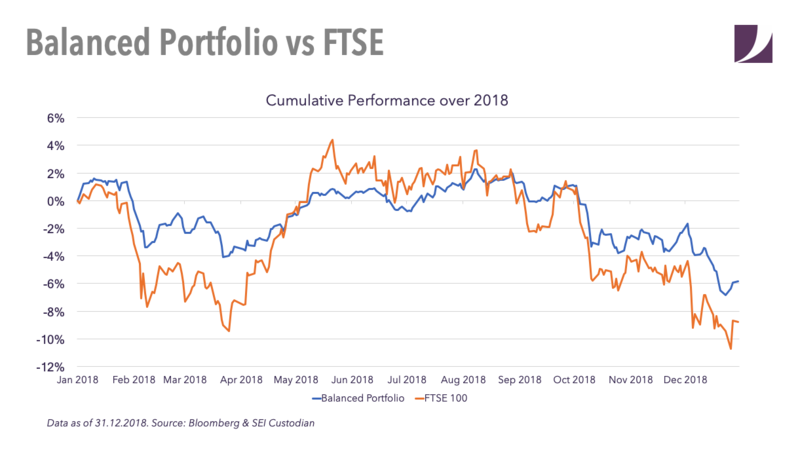 Moving on, here we can see a graph of the TP Balanced Portfolio over 2018 compared to FTSE 100, illustrating lower volatility and higher returns. As for advanced diversification this has genuinely worked. 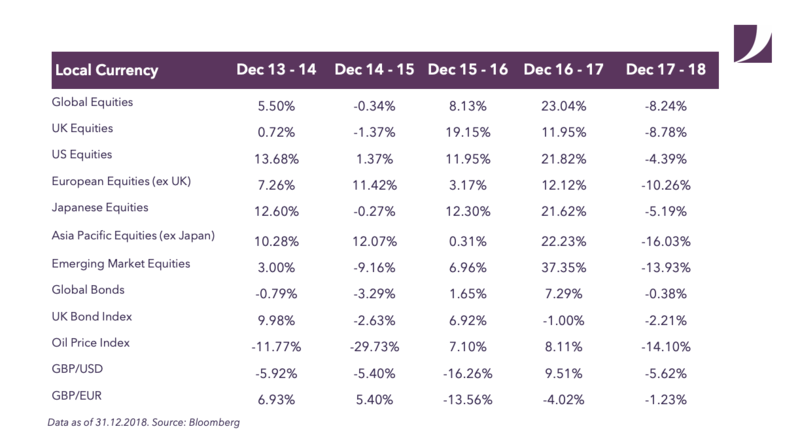 Within the Portfolios we have assets that actually provided a positive return in the more negative months such December, illustrating diversification working. 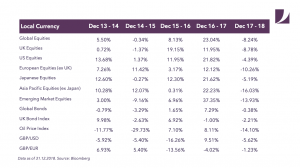 Assets such as gold, various hedge funds and currency funds all provided more than 4% returns over the month of December. Remember the Portfolios contain assets that can actually make money in falling equity markets. If we look at the managers over the year as you know we have added in the True Potential Growth Aligned Fund range to the Portfolios which is one of our best performing fund ranage since its launched in May, offering ever increasing levels of style diversification. Looking at our other partners, Close Brothers showed their stock picking skills producing a strong set of numbers and is also the manager with the heaviest weighting within the Portfolios. This illustrates the TPP investment process working. On the more negative side, the True Potential Goldman Sachs Balanced Fund struggled with its conviction position towards Emerging Markets detracting from performance against a backdrop of US interest rates rises. The True Potential Allianz range also detracted from performance with its momentum style struggling, particularly during the down months of February and March and December. Moving on, how are we managing the Portfolios in respect of Brexit…. Brexit is a challenge for all concerned and the overall outcome is unknown and sufficiently opaque that it would be unwise to try to place a trade around Brexit. What can be looked at is what are the facts. After the initial referendum, Sterling devalued significantly and whenever a Brexit deal looks less likely Sterling has fallen. Any positive or negative news will play mainly through currency markets. For the True Potential Portfolios, our 9 managers all have differing ways of tackling currency risk using hedging at differing levels or currency overlays to help mitigate currency risk. The beauty of the Portfolios with their style diversification is that we are positioned for either a soft or hard Brexit. As the Brexit situation becomes clearer, we have the ability to add to the manager styles we feel would be most beneficial. Outside of currency, diversification is paramount, particularly within an uncertain political environment. Being invested worldwide, not just in the UK and Europe and also being invested in a myriad of assets, designed to be lowly correlated to each other thus offering solutions for every type of Brexit scenario. A question I am being asked right now is should I move to cash? Surely this is a safer option? The way to make good long terms returns is to stay invested and compound up growth. This will not always be comfortable but by letting emotion come first you run the risk of selling at the worst possible time crystallising negative performance and not being able to make that performance up. Over the longer term markets have always trended upwards. In an era of low interest rates, the only way to make a decent return is to embrace risk and be invested. The days of cash in the bank offering rates of 5% are long gone and the likelihood of interest rates climbing back up to historical levels is remote. With inflation at over 2.2% and cash returns significantly lower than that, inflation is eroding away returns for cash investors. Overall, we are constructive on stock markets as we move into 2019. After 2018’s falls, valuation levels are now at below long term averages for all the main geographies. As a consensus, the managers that we partner with see good fundamentals, strong business confidence and generally accommodative monetary policy. Global growth is slowing but from the exceptional and arguably unsustainable levels seen in 2017. Markets are becoming less sentiment driven and are now moving back to fundamentals. Federal Reserve policy, the key driver of return for virtually all of last year are now potentially going to pause raising rates in March allowing stock markets room to breathe. The Fed is now taking a data driven approach rather than a policy implementation at all costs stance. This is a cause of comfort for markets. At an asset class level, overall, we see convergence with other areas catching up with the US. 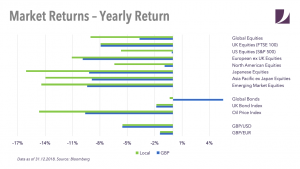 The Emerging Markets look particularly attractive, one of the best performing equity markets in Q4, with investors seeing the value that is clearly on offer from companies, many of which have long been household names in the West. A potentially weakening US Dollar and better US/China relations all add to the investment case. The UK is clearly undervalued right now and Brexit looks to be coming to a conclusion of some sort of deal. 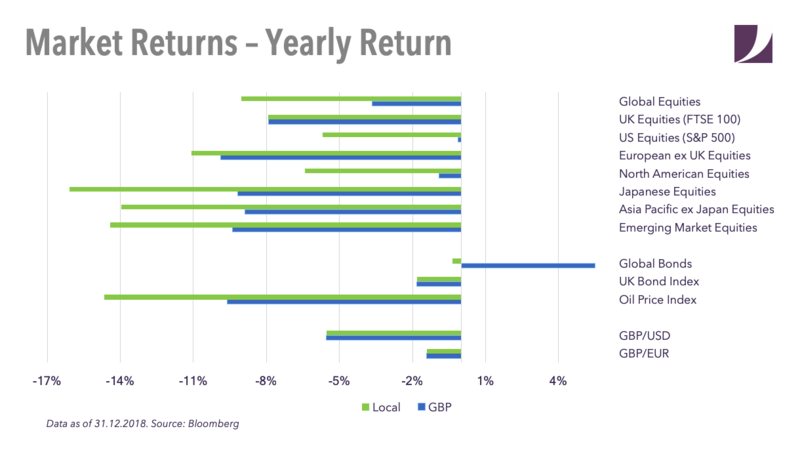 UK equities could offer good returns in 2019 and are clearly an unloved asset class. Europe and Japan both are pricing at good valuations. Japanese structural reform, Shinzo Abe’s tenure and more shareholder friendly attitude all bode well. Europe is starting to deal with last year’s issues with a budget agreed in Italy, although clearly idiosyncratic risks still exist. Overall, a positive view, cognisant of risk and one of opportunity as asset prices have fallen. Finally, it is important to emphasise that diversification is the way to navigate through differing market events, spreading risk and not just concentrating on one single geographical area or asset class. With the True Potential Portfolios, we can offer a new higher level of diversification, diversification by fund manager style. Thank you very much, I would like to take this opportunity to wish you a happy and prosperous year and I will speak to you soon.